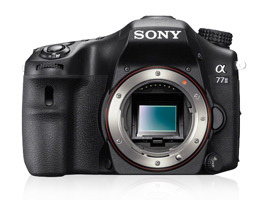 Sitting at the top of the maker’s APS-C translucent mirror models, the A77 II is the update to the popular A77. Like its predecessor, this model appeals to a wide range of users, including enthusiasts and professionals. The fixed semi-silvered translucent mirror permits blazing-fast captures up to 12 fps, while retaining live view using an 2.4m-dot resolution electronic viewfinder, and perhaps more importantly, includes autofocus. Indeed, autofocus has been substantially enhanced in this model, with a 79-point phase detect system (using a dedicated AF module, rather than being integrated with the image sensor) and a wide 40% coverage of the frame. The AF system is also highly customizable, close to the Nikon D4s or Canon EOS 1DX in scope, but in a camera with a much more accessible price. Despite a new sensor, it retains the same pixel count as its predecessor (24-Mpix), but features a RGBW pull-out rear LCD screen and the same 1080/60p video, albeit with the addition of XAVC S over the previous model’s AVCHD recording. Sony has also added Wi-Fi with NFC, but they’ve dropped one of its forerunner’s most coveted features, built-in GPS. Nonetheless, with an impressive autofocus system and high continuous frame rate, the Sony A7 II is a well-rounded camera that’s ideal not just for sports and action photography, but also for all-round use, including video. We’ve tested a number of Sony-branded lenses as well third-party options from the likes of Sigma, Tamron (part-owned by Sony), and Tokina, covering a range from 8mm to 500mm in focal length (equivalent to 12.3-770mm in angle-of-view on a full-frame 35mm camera), to help you with your choice. We’ve currently tested 20 primes on the Sony A77 II, covering focal lengths ranging from 16mm up to 500mm, equivalent in 35mm full-frame format to 24mm to 770mm when taking into account the camera’s smaller sensor with a 1.54x crop. 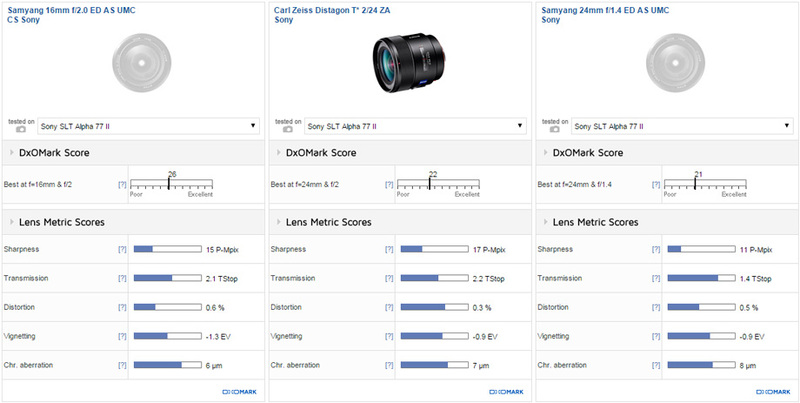 DxOMark scores range from an impressive 31 points for the Sigma 35mm f1.4 DG HSM A with a native Sony mount to a still-reasonable 16 points for the aging Minolta-designed Sony 20mm f2.8. We’ve split the results into three groups — wide-angle, standard, and telephoto, to help you narrow down the best in each one. Five of the 20 tested models were in the wide-angle category, ranging from 16mm through to 28mm, the equivalent to 24 to 40mm or thereabouts on the Sony A77 II. Anything higher than 28mm falls into our standard category, but some still consider 40mm borderline. Be that as it may, the three best-performing models were all wider, with two 24mm models (35mm equivalency) and a 16mm (24mm equivalent) model — the latter achieving the top slot on account of its smaller image circle: it’s not a full-frame model, but designed for APS-C instead. The South Korean-made Samyang 16mm is well corrected, but lacks the peak sharpness levels and lower distortion of the full-frame Zeiss 2/24mm (24mm f2.0). If the $1250 asking price of the Zeiss is difficult to justify, Samyang’s high-speed 24mm f1.4 at just $600 model brings up the rear with 21 points, but has lower sharpness levels and slightly higher, more noticeable distortion. If lens speed isn’t critical, however, and you have no need for a full-frame model, the 16mm f2.0 at just $479 is difficult to overlook. Four of the 20 prime models tested fall into the standard category (45-50mm equivalent), with the hugely popular Art series Sigma 35mm f1.4 DG HSM A available with native Sony mount pitched against three Sony models. With a smaller image circle and lighter-weight build, the two DT models are competitively priced as well as big on performance, particularly the DT 35mm f1.8 SAM. At just $325, this model is in second place to the Sigma, and even has the highest peak sharpness of the group. We’ve analyzed the performance of 11 telephoto lenses, including two super-telephotos, covering 50mm through 500mm, the equivalent in full-frame terms to 75 to 770mm on the Sony A77 II. DxOMark scores range from a high of 30 points for the dual-branded 85mm f1.4 ZA through to a still-respectable 18 points for the Sony 500mm f4 G SSM super-telephoto. In fact, after the Sigma 35mm f1.4, the Zeiss-designed Sony-made 85mm f1.4 ZA (130mm equivalent) model is the second-best-performing model we’ve tested on the Sony A77 II. And with peak sharpness levels equivalent to 22P-Mpix, it’s also one of the sharpest. It performs well at the maximum aperture, but at around $1400, it’s not exactly accessible. With an image circle designed to cover smaller APS-C sensors, Tamron has recreated its highly-regarded full-frame 90mm f2.8 Macro series in the form of the $499 SP AF 60mm f2 Di II LD Macro. It is a true macro, with a 1:1 magnification ratio, high optical performance, and good sharpness levels throughout the aperture range. It’s not quite as sharp when stopped down as the very reasonably-priced Sony 100mm f/2.8 Macro (at $679), the third best in this category. Still, the Tamron has much higher chromatic aberration than the Sony model. When used for portraits, that’s not so restrictive, but it is high for a macro, where fringing is particularly troublesome. Cropped-sensor cameras lend themselves well to zoom lenses, going some ways to offset the dearth of short-focal-length primes designed specifically with a smaller image circle, while favoring longer focal lengths. 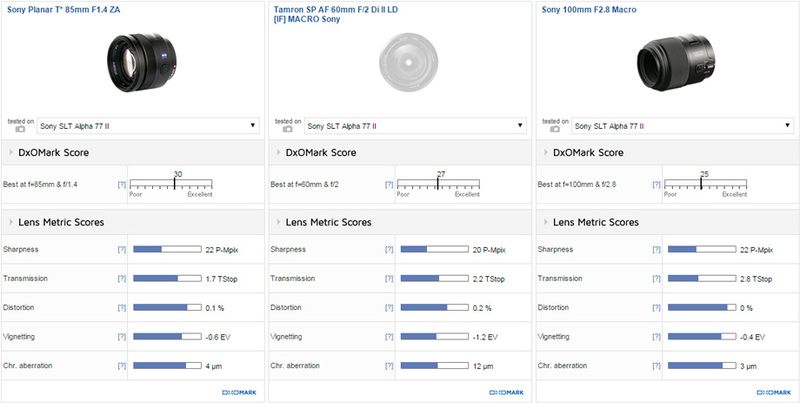 Our lab technicians have currently tested and analyzed the results from 28 zoom models on the Sony A77 II, covering an ultra-wide 8mm through 400mm, the equivalent to 12mm to 600mm on the cropped APS-C-format sensor of the Sony A77 II. 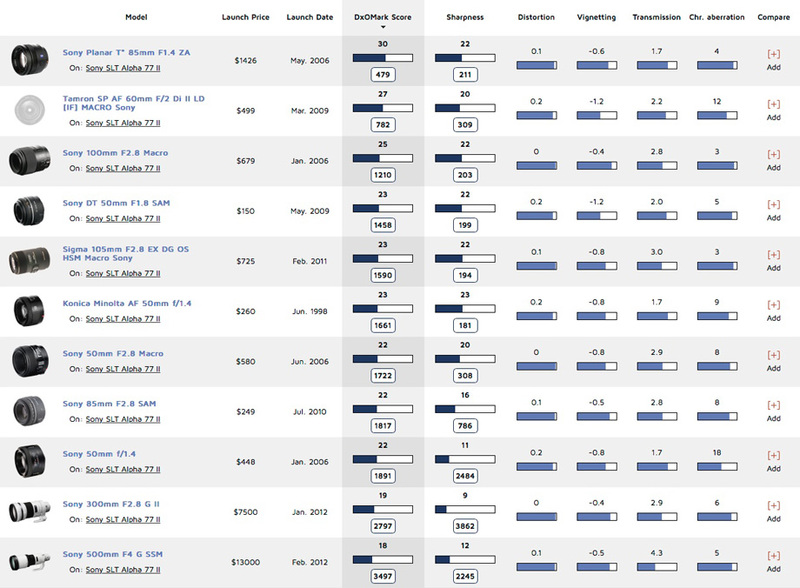 While we analyzed the results of all these zoom models, there are quite a few that straddle both wide, standard, and telephoto zoom categories, so we’ve compiled an at-a-glance guide, splitting it into two groups — wide-standard and telephoto. All three of the best-performing standard zooms offer a similar focal range, but zooms made for cropped sensors offer better value than full-frame models, hence the huge difference in pricing. Although the Sony Zeiss Vario-Sonnar T* 16-35mm f2.8 ZA SSM is impressive in build, specs, and optical quality, at $1599 it doesn’t really make any sense to choose this if you’ve no intention to use it with a full-frame model at some point. Fortunately Sony offers a smaller, lighter and cheaper alternative in the Sony DT 16-50mm f2.8 SSM. While peak sharpness is marginally lower, the Sony DT 16-50mm has excellent sharpness from f/4 onwards at any focal length, and it is good wide-open from 16-35mm. The exception is wide-open at 50mm, where sharpness drops off, but at f/4 it is sharp again right across the frame. If the budget doesn’t extend to the $750 for the Sony DT 16-50mm, the Sigma 17-50mm f2.8 EX DC HSM is a sensible and convincing option. It offers a similar focal range, but it is not nearly so good as the Sony wide-open. Stopped down a little, however, like most lenses it performs well, with good sharpness and low levels of chromatic aberration. Like most 70-200mm models, it performs really well at the short focal lengths but starts to struggle at 200mm. Wide-open at 200mm, it is disappointing, but at f/4-f5.6 it performs well and is very sharp centrally. Both DT models perform surprisingly well and even compare well with the much more expensive 70-200mm f/2.8. Edge-to-edge sharpness, although nice to have, isn’t the be-all and end-all in a lens like this, and while the $230 DT 55-200mm has a slight edge in sharpness at the longer end of the range, the DT 55-300mm is no slouch and the extra range is genuinely useful. At $350, there’s a premium over its sibling, but it is the more practical of the two.